As you read this hiking jacket review, take note of the features I mention, and how I decide whether the jacket is “fit for purpose”. That way, you can be confident you’re not overlooking important features as you look for the best hiking jackets. Want a quick run down of the best womens hiking jacket features? OK, I admit it. Hiking jacket reviews are a secret addiction of mine. I’ve been known to ask strangers I meet on a trail what they like about their hiking jackets, sometimes at inappropriate times (pouring rain, for instance). I can’t help it. I love hiking jackets! Most women’s closets are crammed with shoes and sweaters – guess what dominates in mine?? But while I'm in a confessional mood, let me admit that there's one brand I've been intrigued with ever since seeing it on German hiking companions in Greenland a few summers ago. Nicely fitted jacket but seemed durable; looked comfortable, too. So imagine my surprise when, out of the blue (a pun that will become apparent in a moment), I was asked to test a softshell JW jacket! I jumped at the chance of doing this hiking jacket review, not only because it has a snazzy logo (wolf print) but because it would satisfy my curiosity. But would the jacket stand up to trail conditions like wind and rain? 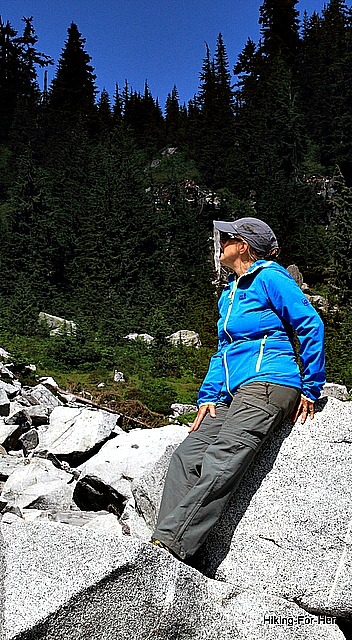 This hiking jacket review focuses on the “Turbulence” women’s soft shell jacket. I did not purchase this jacket. I have no affiliate or commission arrangement with the company. My only intent is to wear this jacket on a some day hikes, and then tell you what it's like to wear this jacket on a hiking trail. As you can see in the photo, the jacket is “Brilliant Blue”, a tad too aggressive for my usual taste in trail wear but definitely a color found in nature so it fits my self-imposed rule about hiking gear colors. If you like even brighter colors, this jacket is offered in some great choices! I’m 5’3” and prefer my hiking jackets to fit loosely in order to accommodate layering, so I tried a “medium”. For a trimmer fit, the “small” would have been perfect. On first touch, I noticed that the jacket has 2 definite “sides” to it. The outer surface is smooth, which bodes well for water repellency. I’m curious about what my rock scrambling, brush whacking habits might do to it, though. The inner surface has a nubby texture: tiny raised patterns surrounded by smooth surface. When I consulted the tag, I learned that this feature is called a “flex shield”, and the loopy inner surface “keeps fabric off the skin”. Hmm… that sounded intriguing! I zipped and unzipped the jacket a few times and noted that its seams were well sewn and the generously sized pull tab also had a wolf print on it (totally irrelevant, but I love to track mammals and it was a nice touch). I examined all of the other seams and found the same quality workmanship, and also noticed an inner mesh pocket on both sides. So far, so good. The jacket slid on easily over my hiking shirt and I immediately noticed its longer length, below the waist. I appreciate this feature because it prevents my backpack from rubbing the small of my back. Don’t expect it to cover your sit-down area, however. It's not that long, and for taller people, it might even be considered on the short side. If you’d prefer a more fitted look, there are bilateral toggles in the bottom seam, near the zipper, to help you with that. I can envision hiking conditions where this feature would save my torso from chilly breezes. 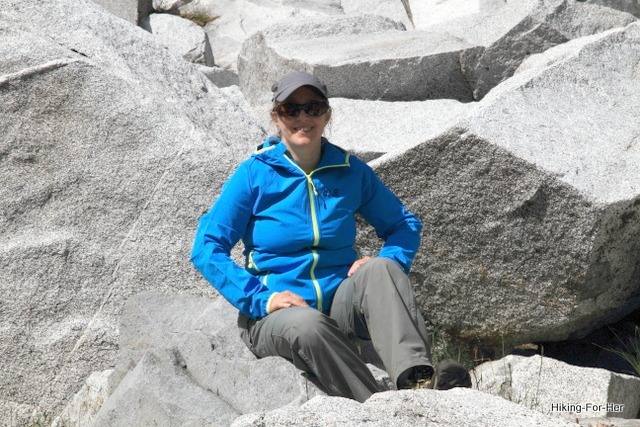 I did my usual “how many layers?” test, and found that a sports bra, sleeveless hiking shirt, and a thin fleece pullover fit well beneath the jacket without restricting my movements. I could have probably added a thin fleece/down vest with no problem. Of course the arms were a bit long, but I expected that because I prefer roominess over perfect sleeve length. And sometimes this plays to my advantage, to cover my gloves, for instance. So if you’re taller, rest assured that the sleeves will be an appropriate length for you. Because it’s a soft shell jacket made of stretchy material, it has good moveability. I didn’t feel constricted even when the jacket was zipped up and the hood was deployed. One little issue I didn’t like: the hood didn’t stay out of the way when the zipper was near my chin. By that I mean it felt bunched up & I couldn’t get the fabric to lie flat, so I had to bring the zipper higher or lower. A minor issue, to be sure. The attached hood felt good in breezy conditions, but it won’t keep rain off your face because there’s no overhang built in. Rely upon your brimmed hiking hat underneath the hood for that. I wonder if the hood will stay on in really windy conditions, because there’s no way to cinch it down. The zipper tab was easy to pull with 2 fingers, another feature I appreciate when I’m in a hurry or have gloves on. Not a trivial feature! Two zipped outer pockets are quite generous in size, nicely angled to keep your hands out of the wind. I managed to stuff a pair of thin fleece gloves into one, and my bandanna and an energy bar into the other, without too much trouble. It traveled well in my pack, coming out unwrinkled even after being shoved into the bottom of the pack for a few days. This might be useful for section hikers who want to cruise into town for a burger without looking like something the cat dragged in. But for me, the biggest variable for a hiking jacket is its performance in wet conditions. The holy grail of hiking jackets is a piece of clothing which keeps cold water off your skin while preventing you from drowning in your own sweat while you’re hiking. I have yet to meet a jacket which pulls off this combination to perfection, but I haven’t given up hope. This jacket promised “exceptional weather protection” on one tag, “basic weather protection” on another tag. What does that mean, exactly? Here’s what I found it to mean under my hiking conditions: The jacket forces water to bead up on the outer surface but prevents it from soaking through the fabric. To be honest, I didn’t have a genuine downpour in which to test the jacket (that’s what the month of November is for in the Pacific NW & I'm writing this in August), but I did have a fierce drizzle for testing purposes. All I can report is that the jacket held its own during 2 hours of steadily wet conditions. I was kept very warm, too (again consulting the tags, it’s the loopy design that lets the air trapped against your warm body to circulate and create an insulating layer). If you’re concerned about heat retention, there’s another version of this jacket which has a layer of fleece for additional warmth. For my purposes, that would be overkill because I wouldn’t use this jacket in winter conditions, when I rely upon my hiking clothing layering system rather than one jacket to provide warmth. What about breathability? It matched what I’ve observed in other jackets, so I’m happy with it. I need to test this jacket under more adverse conditions before making a final judgment, but I can say that the fabric keeps water out but handles sweat reasonably well in the absence of pit zips or other ventilation features. Here’s something else I like about the Jack Wolfskin brand, which I just happened to stumble across. The company has been a member of fairwear.org since July 2010. It's a signal that the company is committed to improving conditions for garment workers. So if it matters to you where you buy your clothing, this might be an important factoid in this hiking jacket review. In order to set your expectations correctly, let me say a few things. This is not a technical jacket, so it won’t be coming on long adventures. It doesn’t claim or appear to be water repellent, so I wouldn’t rely upon it as an outer layer in back country circumstances even for a day hike. It might not stand up to extremely windy conditions so be prepared to switch it out for a windbreaker or have another layer handy. I wouldn’t hesitate to recommend this jacket for day hiking (extra clothing - one of the 10 essentials everyone natters on about) or high summer (warm, dry, calm conditions) multiday hiking trips. It’s well made, reasonably priced, and went through its first washing and came out looking great. I’ve also worn it around town several times and its fitted look didn’t make me stand out as coming right off the trail. It has definitely earned a place in my hiking clothes closet. But as I’ve already admitted, they had me at the wolf print logo on the arm!